Thank you for visiting our site. We dispatch items from japan. We provide our services based on our motto. Your complete satisfaction is our ultimate goal. This item is 100% authentic, Japanese goods. Please be assured that we package each item carefully without causing damage. This album now has a masterpiece that is already known as a standard, and sophisticated Rock'n'Roll suitable for welcoming the new era of the'80s and John' s youthful vocals became a topic. This famous song group was written little by little at the time when it seemed that music activity was stopped after the birth of Shaun, and what the light motif is made is that you can ask by demo / tape etc. Of all stages I can. This work contains sessions at that stage that a huge amount of demo tape is handed over to another opportunity, the song is completed to a certain extent, and actually recording is done in the studio. Most of the sessions held at the hit factory in New York and the record plants were recorded almost irrespective of official informalities and there were many things halfway as collectors items, This work makes all those unnecessary Actually it covers everything with a volume of 4 pairs. 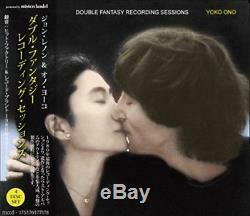 Outtake, another version, session state of John and Yoko's famous board "Double Fantasy" cover 4 disks. Permanent preservation of a beautiful picture / disk specification A tightly pressed board. I would like to arrange with "MILK AND HONEY RECORDING SESSIONS" simultaneous release. DISC 1- (JUST LIKE) STARTING OVER 01. Only The Lonely - Gone From This Place 09. Rough Mix #4 CLEAN UP TIME 17. Vocal Booth #2 Take 1 20. Vocal Booth #3 Take 3 21. Take 7 Guide Vocal 23. Rough Mix #3 DISC 2 - I'M LOSING YOU 01. With Cheap Trick Rough Mix #1 02. With Cheap Trick Rough Mix #2 03. Slide Guitar Over Dub 09. Rough Mix #2 STUDIO SESSIONS 13. DREAM LOVER - STAY 17. SHE'S A WOMAN #1 - C'MON EVERYBODY 20. SHE'S A WOMAN #2 22. I'M A MAN 23. I'M LOSING YOU #1 25. I'M LOSING YOU #2 I'M MOVING ON 26. With Cheap Trick Rough Mix #1 27. With Cheap Trick Rough Mix #2 DISC 3 - BEAUTIFUL BOY 01. Sean Visits The Studio 02. Rough Mix #3 WATCHING THE WHEELS 11. Vocal Booth Take 2 14. Vocal Booth Take 3 15. Take 8 Mix #1 18. Take 8 Mix #2 I'M YOUR ANGEL 19. Rough Mix DEAR YOKO 20. Take 6 Mix #1 24. Take 6 Mix #2 25. Rough Mix DISC 4 - WOMAN 01. Vocal Booth Take 1 03. Vocal Booth Take 4 04. Control Room Talk #1 08. Control Room Talk #2 09. Rough Mix #3 Alternate EVERYMAN HAS A WOMAN WOHO LOVES HIM 13. Rough Mix John On Vocal 18. Rough Mix John & Yoko Duet HARD TIMES ARE OVER 19. Choir Over Dub #1 20. Choir Over Dub #2 21. Choir Over Dub #3 22. Rough Mix BONUS TRACKS 23. STARTING OVER (BASIC TRACK with Voice Over) 24. WOMAN (BASIC TRACK with Voice Over) 25. MAGGIE MAY (From The Session) 26. STARTING OVER Long Fade 12inch Promo Version. USA , Canada , Mexico , Europe , Oceania , Asia = 2 5 weeks. South America , Africa = 4 8 weeks. We accept return items up to 60 days after the item has arrived. However please send the item back to us. Thank you for your seeing my page. Please feel free to question if there is an uncertain point on this page. International Buyers - Please Note. These charges are the buyers responsibility. We do not mark merchandise values below value or mark items as gifts - US and International government regulations prohibit such behavior. The item "JOHN LENNON DOUBLE FANTASY RECORDING SESSIONS 4CD BEATLES Mister Claudel" is in sale since Wednesday, February 28, 2018. This item is in the category "Music\CDs".t" and is located in Ishikawa.